Bangkok (Thailand) – August 22, 2018 (travelindex) – Create a local tourism network to stimulate environmental tourism. The online event was held through Facebook Fanpage TAT CG & CSR which received a lot of attentions and positive feedback. For the activity, participants shared their favorite local tourism attractions and environmentally friendly way of traveling on the activity’s Facebook post. The winners get special prices such as an accommodation package from a luxury hotel, travel package and prize money. 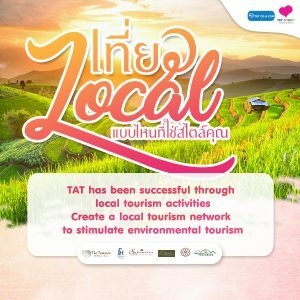 The activity is expected to encourage community travel in Thailand, promote the distribution of income to the communities and create environmental consciousness for both tourists and the communities as well.